Our children are dying at an alarming rate because of gang violence. "Bitter Fruit: The Street Ministry" is the story of a young 15 year old teenage girl named Carol who rose in ranks of the Gangster Disciple family organization to become a G-Queen. Destiny thrust Carol into a gangster lifestyle. Fate predetermined the course of events in Carol's life at a very early age. Life introduced her to sexual abuse which caused her to be placed in the foster care system. Carol slid down a slippery slope into the evil perils of gang violence. Although, the novel is set in 1994, the lives of these characters reveal the same gangster mind-set that young people maintain in 2013. 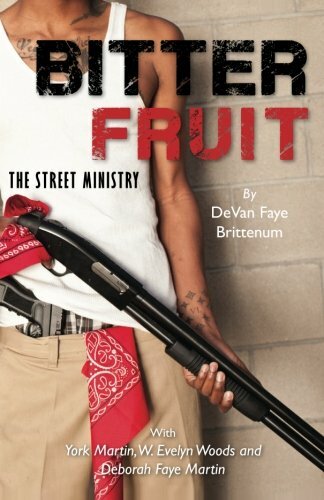 "Bitter Fruit: The Street Ministry" is designed to help children peep into the realm of reality in order to see the horrible acts inflicted on society because of gang violence.